This year, spring and summer are expected to be rainier than usual across Southern Lawns’ service area. This means that on clear days when you’re ready to head outside, plenty of mosquitoes will be ready to greet you. Here are some reminders to help make your yard less appealing to these pests. If the problem persists, Southern Lawns’ mosquito control program can help. Still, when mosquitoes come to mind, our first thought is about the itchy, uncomfortable bites they leave behind. Over the last few years, we’ve heard a lot about their role in spreading dangerous diseases like the West Nile and Zika viruses. But even those aren’t the whole story. 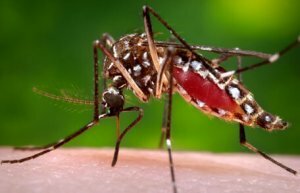 According to the Centers for Disease Control and Prevention, mosquitoes can also transmit malaria, yellow fever, dengue fever, Rift Valley fever, and viruses that cause encephalitis (brain inflammation) to humans. Mosquitoes lay their eggs in water. The newly hatched stay in the water in their larval and pupal stages until they emerge as adults. This is why it’s so important to limit standing water in your yard. Water bowls for pets, birdbaths, and kiddie pools should be emptied and refilled regularly. Other possible problem areas are less obvious, like clogged gutters, plant drainage plates and random spots in your yard where particularly dense soil can cause puddles to linger. Other popular options for discouraging mosquitoes include planting natural repellants like citronella or lavender, burning citronella candles, and applying bug spray. Southern Lawns’ mosquito program is available as an add-on to any of our regular lawn, tree and shrub care programs. Once each month between April and October, we’ll apply an odorless barrier stray to your shrubs, the low-hanging limbs of your trees, and your patio areas. In addition to controlling adult mosquitoes, it contains a larvicide that prevents larvae from developing into adults. Don’t let mosquitoes stop you from enjoying your summer. Give Southern Lawns a call, and we will get your treatments started right away.